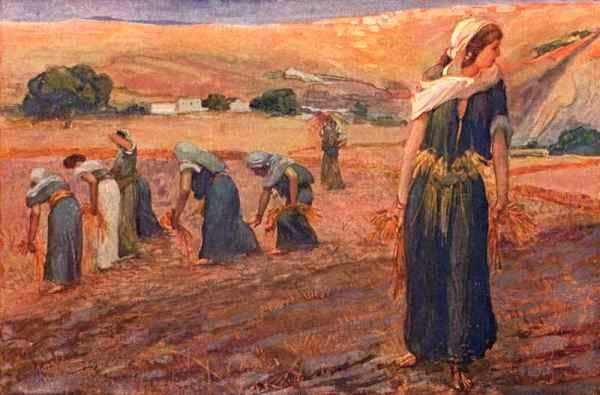 Read Ruth 2:4-10---Ruth meets Boaz and waits to see if he will grant her unusual request to glean. excerpt from page 113 of Postcards From The Widows Path . . .
Let’s drop in on their meeting. "Whose young woman is this?" Boaz asked his foreman, even though Ruth was right there. In a free Western culture like ours, we can only assume Boaz was looking for an introduction, but as a man in the ancient Middle East and a prestigious figure in Bethlehem, he would not look nor speak directly to a strange woman. His question presupposed she was someone’s slave; she wasn’t really a person to him. His question was more on par with, "Where did you find this new harvester?" The foreman explained that Ruth was the Moabite who came with Naomi. He then stated her courageous request. As Ruth listened to the men talk, her heart must have pounded. Was her bold request a newcomer’s social blunder, a rude interruption? She must have wondered, Did I make a mistake? Should I have kept my big mouth shut? I don’t know these people! Will Boaz agree, or will he be insulted and angered? Boaz held the power to drive her away, to punish her, and to convince the whole village to ostracize her. How dare she, a Moabite, have the audacity to make such a request? Ruth must have sickened at the thought of what that risk could have cost her and Naomi. I might have ruined everything, she thought. Completely at his mercy, Ruth waited for Boaz to decide her future. At best, Boaz, this landowner of superior status, would give directions to the foreman, and the foreman would convey them to Ruth. But instead, Boaz himself turned to the socially clumsy, outside-of-mercy, undeserving-of-grace, destitute, and in-need-of-redemption Ruth. Like the sun shining out from behind a cloud, he immediately brightened her day, "My daughter," he called her. How would you have felt if you were Ruth, waiting for Boaz to determine your fate? Have you personally found your relationship with Christ to be at the "My daughter" level, or is it more impersonal? With the bad things that have happened in my life, like Ruth, I need grace, mercy and forgiveness too. Would you turn and call me your daughter? Would you grant me the favor of your redemption and salvation? Thank you for leading me to this point today and for your lavish love and grace. I am blessed, strengthened and encouraged that God gave Ruth the courage to speak out even though it may have been a faint whisper she looked to one whom was greater than herself. And we like Ruth look to one greater than ourselves, God promises whosoever will let him come and I will never turn any away. God tells us we have not because we do not ask, as Ruth asked, so did she receive. God gave her grace to speak up, look up and receive. As a heartbroken, confused and even frustrated widow I also seek the same favor of God to be called his daughter and rest in his mercy of love. Ruth spoke up and received. Excellent point! I'm so glad you cared to share today, thank you!